Why choose Grip Power Pads®? The answer is simple: Because they outperform every other pad! Protect your hands and fingers from calluses and blisters? Keep your hands from getting sweaty or overheated? Are easy to put on and take off? Last longer than a handful of uses? Are easy to wash and keep clean? If you’re serious about your workouts, we’re sure you’ve done the research. And as you’ve probably seen, when it comes to performance, reputation and testimonials, Grip Power Pads® kick the competition to the curb! 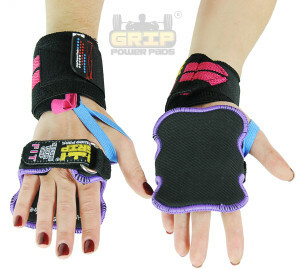 Grip Power Pads® are the ultimate alternative to workout gloves and straps. Grip Power Pads PRO: PRO pads are made with a soft 0.2” thick spongy, rubbery materi al as well as Velcro straps and a stainless steel metal ring. The ring allows you to adjust your grip pad to any hand size. Keep in mind: Many other grip pads on the market are prone to slipping due to the material they’re made of. Not the PRO! The rubber material of the PRO model provides the best non-slip grip you can find in any pad, and features a stylish yellow stitching around the edges for a sharper overall look. PRO is our most popular model and – because of the rubber material – is ideal for heavy lifting. Grip Power Pads NEO: Like the PRO, the NEO features Velcro straps and a stainless steel metal ring, which allows you to adjust the pad to any hand size. However, unlike the PRO, the NEO is made with a neoprene material that doesn’t rub against your hand. This neoprene material is known for its long-lasting durability as well as its non-slip properties. While our PRO version provides a better non-slip experience for heavy lifting, the NEO is best for everyday use. Grip Power Pads FIT: Our FIT is a near replica of the NEO in that it’s made of neoprene, and features straps and a metal ring. However, as FIT is designed specifically for women, both the pad and ring are smaller. The pad is 0.12” thick. The FIT is designed for everyday use and features pink stitching along the edges for an added feminine touch! Grip Power Pads® are the ultimate replacement for straps and workout gloves. Just how do we beat the competition? Take a look! Grip Power Pads® are superior to workout gloves… hands down! Workout gloves are notorious for making your hands hot and sweaty. And you know what happens when your hands feel like this… The gloves become difficult to take off. In addition, if your workout gloves feature zippers, these zippers rarely last longer than a dozen uses before they become stuck open and – perhaps worst of all – fail to pad your fingers. You’ll be happy to hear that the three latest lifting grip models from Grip Power Pads® address these issues head on! Since NEO, FIT, and PRO are pads – not gloves – you never have to worry about your hands getting hot or sweaty. And while gym gloves can be difficult to put on or take off, Grip Power Pads® are as easy as putting the pads on your hands, adjusting the straps, and starting your workout. By choosing the right pad for your workout, you can be sure that your entire hand (including your fingers) will be fully protected. Grip Power Pads® protect you so much, you won’t even have to remove any rings you wear during your routine! Grip Power Pads® put other grip pads to shame. Sure there are other lifting grips on the market. So what makes our NEO, FIT, and PRO better than the competition? It all boils down to the material. NEO and FIT feature a unique neoprene material that makes them far more durable and nonabrasive than other grip pads. This material also prevents your hand, or the bar, from slipping. In addition, PRO’s rubbery material is unlike any other non-slip pad on the market, making it perfect for heavy lifting. Grip Power Pads® also beat out other grip pads due to the fact that they don’t have finger holes. Some grip pads feature these, claiming that they will help protect your fingers while keeping the pad in place. But what these finger holes actually do is increase the heat and sweat buildup on your hands. They also sacrifice the integrity of the pad itself. These types of pads generally degrade quickly, and – thanks to the finger holes – also tend to acquire an odor eerily reminiscent of the gym gloves you’re trying to rid your life of in the first place! Grip Power Pads® beat out straps any day! Weightlifting straps have been a mainstay at local gyms since people first started lifting weights. They’re considered a great way to protect your hands during a workout; however, most people will admit they’re not really user friendly. Most straps are extremely time consuming and confusing to put on. We know that when you’re in the middle of a routine, you want to have as much control over your rest time as possible. Who wants to spend the time between reps putting on and adjusting straps? And do you really enjoy the bulkiness of weightlifting straps that get in the way when you’re doing a routine that doesn’t require them? With Grip Power Pads® NEO, FIT and PRO, putting on – and taking off – your pads is as easy as 1-2-3. Easily tuck them into your pocket or waistband, or put them off to the side when you’re not using them. As you can see, Grip Power Pads® are the ultimate replacement for straps and workout gloves. With our NEO, FIT and PRO, both men and women have the option to protect their hands and fingers without worrying about slippage, smelly gloves or being stuck with straps that were just too difficult to use or store. Check out our patent-pending products today and start seeing results at the gym immediately!